Why the ‘New Player Zone’ was removed. We only have 10 or so new players every day. Of those, maybe 1 or 2 tries playing online. Some go with the default player zone, but some – wanting to be careful – choose the ‘new player zone’. So lets take a look at that. So as you can see it’s roughly 0-3 new new player zone matches started a day. Also note that it takes TWO to pair up and become an active matchup. So what new players are doing is starting a match in the ‘new player zone’ (only visible to new players). And then left hung out to dry. There was one point there in the graph where there was no activity for like 7 days in a row! That’s crazy. Regardless nobody wants to wait a day or two to get a matchup. So in 1.72 I have officially removed the ‘New Player Zone’ (along with the ‘elite zone’). And now we all match up in the one default area. As you see below there are roughly 50 matches started a day in the regular area. And below that you can see that this resolves to around 500 rounds submitted per day. These numbers are nothing to brag about, mind you, but the normal zone is still a better place to be for new players rather than leaving them out in the cold just so they can play someone who hasn’t played before. So yeah, with 1.72 we welcome back the new players into the regular pool. The recent campaign balancing and extra units for new players will definitely make that transition a decent one. Musket Smoke II is not dead (yet). One day I might re-kickstart it to see if interest has grown, or at perhaps just release the online battles part. If you are interested.. here is the old kickstarter page. The English Civil War – A Single Player Campaign. 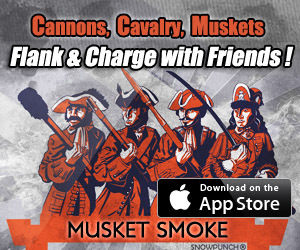 We also have a Musket Smoke Facebook page for those who have interest in interacting with each other. Looks great – can’t wait! I love your game. Me and a buddy of mine can’t get enough of it. We play each other online every single day. There just ain’t any iOS multiplayer hex turn based military games out there. I wish this game had more followers so it would grow. I wish MS2 was made. I wish there were more maps. I wish I could edit maps. I wish the maps were bigger. I wish, I wish, wish. But for now, I’ll love this game. Can’t wait to your next endeavor is done. It is a sad news about the MS 2… I wish you continue on the project! If you only give us unit-map-scenario-campaign editor to make solo games, your legacy will be insured; you bet, I am willing to make some famous wars from 16 to 19 century with your game engine, starting with Dutch War for Independance to the Second Boer War (I am History master’s degree, and war/strategy board game designer from 10 years old, which is 40 years experience by now). Thank you for the game. It is simply great. You have managed to put all things that true history wargamer loves in the most elegant and fulfilling manner. I do not know what makes me more excited: The game itself or your skills as a game designer. Amazing. Perhaps one day an Angel Investor will contact me about the idea of creating a great historical war-game. Something educational that is actually fun to play. Until then, these games are just a side hobby for me.